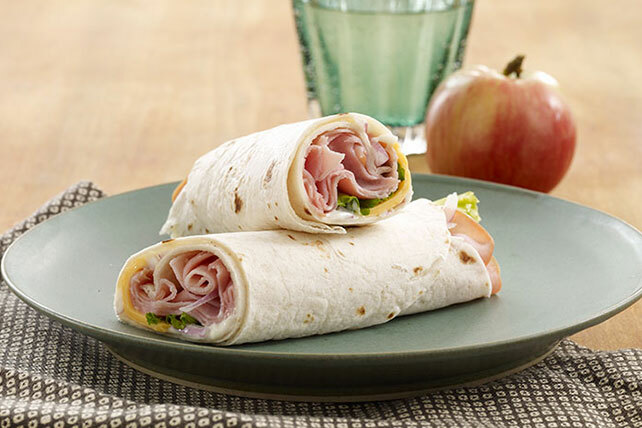 Make a twist on the sandwich with a ham and cheese wrap. This Easy Ham & Cheese Wrap is tasty and quick when you use a tortilla for this great recipe. Top with lettuce, Singles and ham; roll up. For added color and crunch, add one or more of the following to the sandwich wrap: tomato slices, chopped green or red peppers, thinly sliced red onions. Serve with a piece of fresh fruit and assorted cut-up fresh vegetables. Wrap tightly in plastic wrap; refrigerate until ready to serve.